A collection of music lessons and performances put together for my friends. Not your standard way of playing guitar. This guy plays in the style of Michael Hedges. 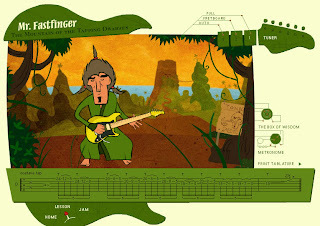 Guitar Player TV is another great resource for learning or advancing your guitar skills. Drummers from Red Hot Chili Peppers and Deep Purple in a 2 minute performance. A good show on a few different techniques. GuitarShredShow.com is one of the coolest websites I have checked out lately....and you can learn some nice shredding licks from it too! Learn the basic guitar chords, C, D, G, Em and Am.